I feel like I’ve just helped my husband to dump a girlfriend. We’ve been going to the same comic shop for over four years now but since we moved house the shop is now a two hour drive away. We’ve been going back every couple of months anyway as he likes and trusts them but also because they are one of only three shops in the country that can order through Previews, the catalogue of forthcoming comics, books and other stuff from the American publishers. They have very kindly posted his copy of Previews to him for the past few months and he has emailed his order in but it’s not quite the same. I finally persuaded him to visit one of the other Preview stockists last weekend. This one is only 40 minutes away and in a city I go through quite often to get to the airport. The shop is a bit hidden away but once we found it we discovered they have a good range of stuff and not just Tintin and Asterix which seem to be the local comic diet. Even better it seems the new manager is a Londoner, speaks English and understands/likes American comics himself. Hurrah! Cue a series of emails, orders and plans as Scifi hubby starts to shift his forthcoming Previews order to them. The whole process started to feel like a series of first dates! Then the hard bit – we had to visit the old comic shop to collect last month’s delivery and then tell them he was moving shops. Scifi hubby came over all tongue tied. It really felt like I was watching a teenage boy working out how to dump his first girlfriend. So I did it for him! I couldn’t bear the agony any longer so just told them straight. We will still have to go back for a few more months as items we have ordered already finally arrive but hopefully by Christmas 2015 we should be done. Frequently asked questions – can I bluetac the babies head?! What is the normal age to visit a comic shop for the first time? I’m not sure if it’s normal but Scifi baby visited his first at six weeks and has been to four now. He even played in the stock room, had his nappy changed and had his lunch in one of them. How do you take a passport photo of a baby? At what age should you first watch Star Wars and which movie should you start with? The second part of this question is a no-brainer for me – it’s got to be episode four. In fact I might pretend episodes 1-3 don’t exist. 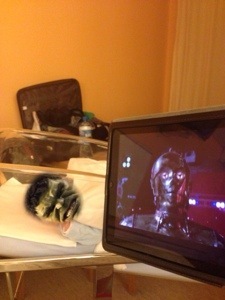 Ignoring the precocious parenting ‘advice’ about TV/screen time for babies completely Scifi baby watched ‘A New Hope’ at just three days old whilst still in hospital. 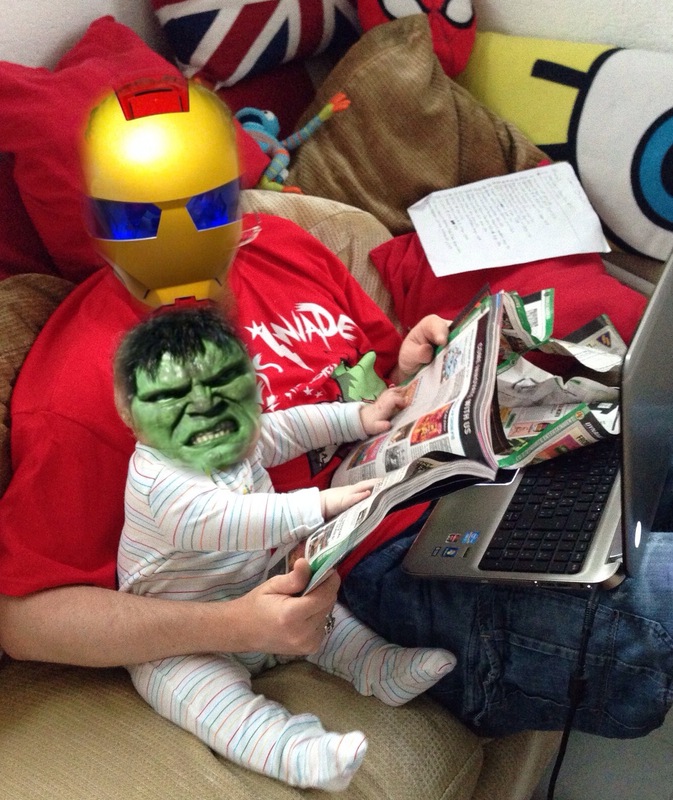 How many superhero outfits should a baby have? Erm… Do other baby clothes exist? I thought babygros only came as Batman, Superman or Spiderman. Oh and Tigger so we get to laugh at our darling baby with ears and a tail. What age should a child first watch Aliens? Ok so he’s not really seen the movie, even Scifi hubby draws a line somewhere. 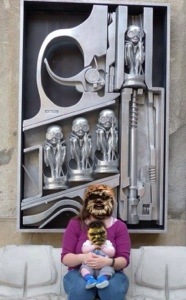 But he has visited the HR Giger museum in Gruyeres already and compared notes with the bullet babies. Shopping with Scifi hubby can be a little like trying to shop with a four year old in tow. We have to go into every toy shop, check every aisle of hotwheels cars and every bookshop for graphic novels. He doesn’t want to stop to eat, or have coffee and doesn’t have a lot of patience with me clothes shopping. So you can understand that I was over the moon when our friends at Reed Comics offered to let me use their ‘man crèche’ facilities! I’ve mentioned our friends who run the online comic shop before and they frequently save ‘our’ skins when no one else can source a specific book or toy. We were visiting their local area for a few days recently and had planned to see them for dinner when, knowing I wanted to go clothes shopping, they made this awesome suggestion. I could drop Scifi hubby off at their offices in the morning and collect him later and Scifi friend Mat could join him too. They would feed and water them and make sure they didn’t get into too much trouble. Cue lots of jokes about putting a ball pool in the spare office (Bazinga! ), finding Batman playmats for him and what time nap time was. 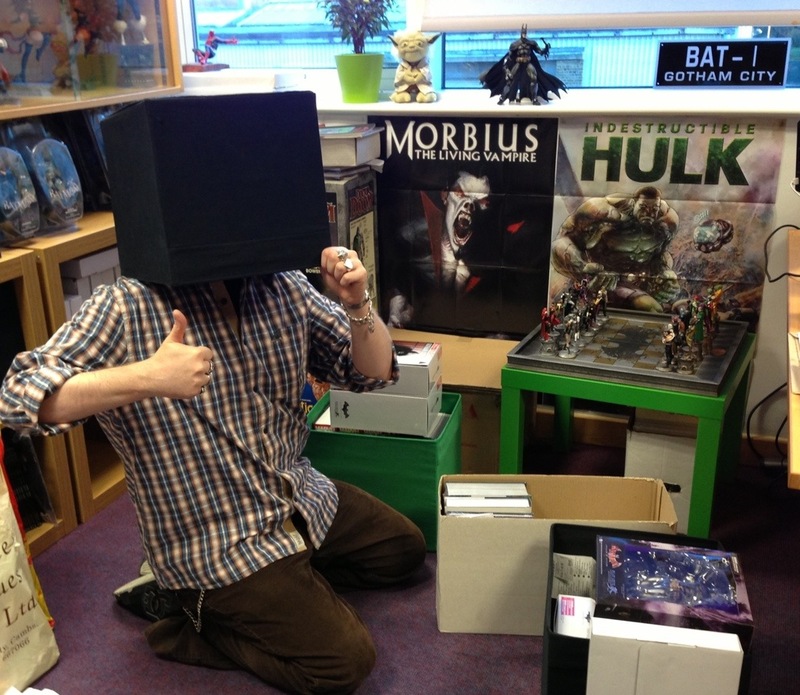 Now of course there’s a risk to leaving Scifi hubby unsupervised in a comic shop all day. I knew that this would be a rather expensive crèche if he had all day to pore over everything in their stock and catalogues but boy was it worth it. I got a whole day shopping, found everything I wanted, stopped for lunch and didn’t look like a stressed parent by the end of it. I returned to the offices to find out how much damage Scifi hubby had done to the bank balance and discovered him, in true crèche style, sitting on the floor playing with boxes. For a minute I had images of him preferring the boxes to the contents and that maybe I’d got away with it but apparently he had actually bought so much stuff that we couldn’t get it all home in the suitcases. The Reeds had kindly offered to store a whole pile of things for him until we visit by car later in the year. There’s now a ‘Scifi hubby corner’ in their offices. Thanks guys! There’s a business idea in man crèche though – can I book him in for next time please? You know all about my obsession with the Smurfs but I haven’t dared to own up about my fixation with My Little Ponies yet, so confession time…. As a child I had almost all the My Little Ponies. Some were gifts but most were bought with pocket money. 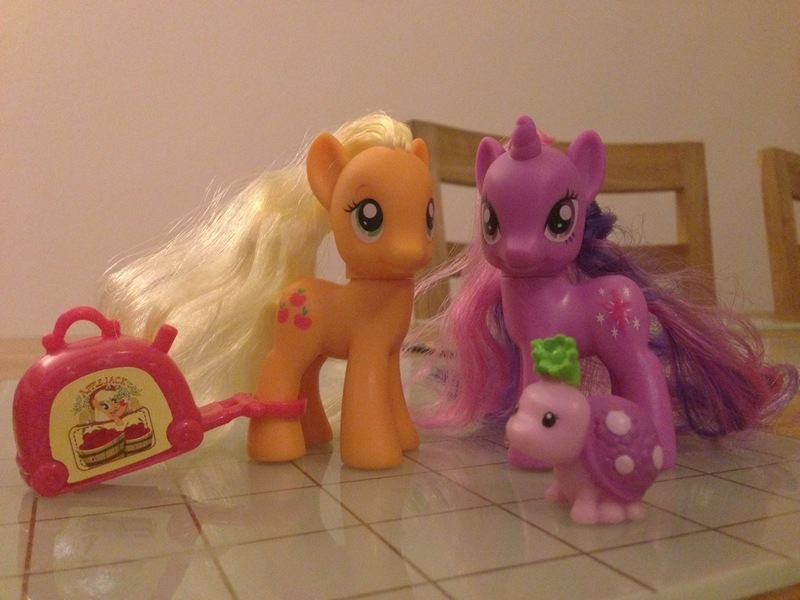 In fact my pocket money mysteriously went up whenever the price of My Little Ponies went up – clever parents! I’ ll always remember being given the My Little Pony castle for Christmas one year from my Grandfather. 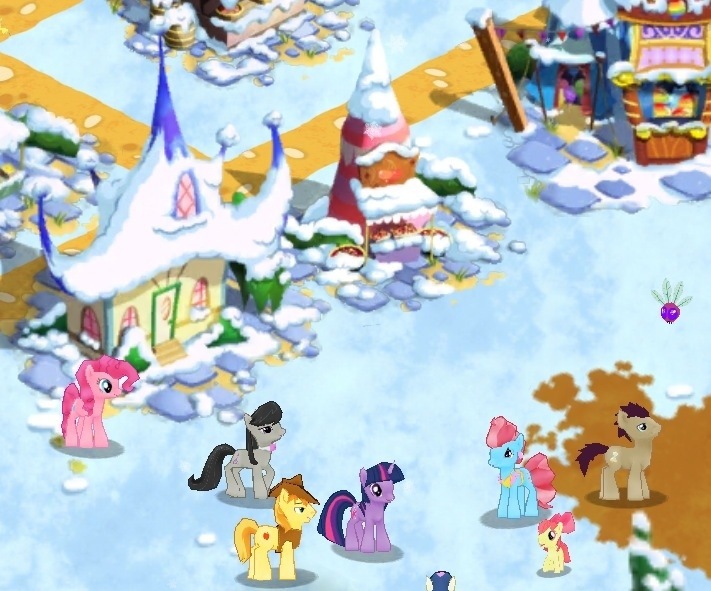 My brother got Skeletor’s castle and he kept stealing my ponies to use them as bad guys. Evil little brother. Then there was the baby ponies which my mum loved most. I vaguely remember drowning them in the bath at some point. Predictably when I was ten years old I outgrew them. Our school was holding a car boot sale and I sold all of my ponies. I can’t even blame my parents, it was my idea and I did the bargaining on the day. Of course now I, almost, wish I had kept them. Although to be honest they would only be up the attic with the collection of egg cups, rock labels (the bits of paper that come with sticks of holiday rock), school books and all the other jumble! That was until Hasbro brought out a My Little Pony game for the iPad. They are so cute. They dance if you tap them, play catch with a ball and fly. I’ve become hooked on playing with my ponies and harvesting their crops of lemons and bath towels (trust me somethings really are not worth knowing the details about). I had been resisting buying any of the toys. I don’t need them. 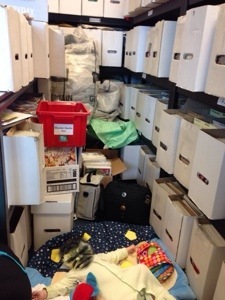 We don’t really have the space (it’s all filled with Batman). And I already collect Mr Potato Heads. I even resisted buying ‘vintage’ ponies (i.e. the ones I sold) at New York Comic Convention. 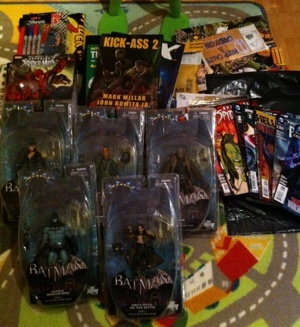 Somehow all of this fled from my brain when I got dragged to the comic shop this weekend. Just as we walked in the door there was a whole stand of My Little Ponies, including some of the ponies that I ‘own’ on my iPad. Scifi hubby can spend hours in the comic shop so I had a long time to look at them and dither. In the end I decided to take a leaf out of Scifi hubby’s book with his Hot Wheel cars – he’s now having to buy me a pony every time he makes me go to the comic shop. I ended up with two on Saturday as we went back to the comic shop twice. Any bets on how long it will take for me to have all of them? Scifi hubby is still away but his Previews order has arrived at our local comic shop. They would, of course, keep it a week or two but I thought it would be nice for him to come home to find a mountain of goodies waiting for him. So I nipped in on my way home from work. Scarily they know me on sight now and instantly produced his order. They also know I don’t know a lot about comics so they don’t even try to talk comic stuff with me so we had a nice chat about the weather instead.